Many of the flat tire calls we receive are the result of irregular tire wear. These are caused by bad wheel alignments. Alignments are done to make sure the wheels of your car are parallel to each other and tires meet the road at a correct angle. It is done by any repair shop or dealership. If you do not have a proper auto alignment, not only will it impact the quality of your ride, but it will also cause the tires to wear down unevenly which costs you a lot of money to replace them. Proper alignments will reduce vibrations and maintain a straight trajectory without pulling to either side of the road. How much does it cost to get an alignment? ​The costs vary depending on the type and size of car that you are aligning. We recommend a 4 wheel alignment and you should make sure that this is what you are getting, as you may be charged less for a front wheel or a thrust alignment, which takes care of the rear axle only. With a front end alignment, only two of the wheels will be fixed. 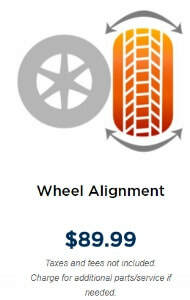 A 2 wheel alignment can cost from $60-$160 depending on the make and model of your car and the warranty offered. The warranty is either 6-12 months or 6000-9000 miles (which comes first) and up to 1-5 or lifetime warranty with unlimited mileage, depending on the shop who offers it. ​A onetime alignment will only be performed once and carries a warranty for a set period of time or miles, whichever comes first. Some companies choose to offer a one year service which will provide an extended warranty and additional alignments performed free of charge for this defined duration. ​Larger vehicles could cost more when you want to get a 4 wheel alignment. The cost varies greatly between different companies that offer this service as only labor is involved and no parts are replaced or repaired. How long does it take to get a wheel alignment? Whether it’s a 2 or 4 wheel alignment it shouldn’t take less than 1 hour to do this service. If your car is returned in less than 10 minutes the service was not done correctly and you should not pay for it. Why do wheel alignment? Why is it important to get wheels aligned? Your vehicle pulls to either side while driving. Steering is difficult or unstable as speed increases. The car tends to vibrate with extra road noise. The tire shows uneven wear or makes noise on turns. When should you align your wheels? The best way to save money on alignment service is to keep an eye out for special offers and discounts. Most companies and dealerships offer a free alignment check to tell you the exact condition of your tire when you purchase the tires from them. Mavis Discount Tire offers $10 off. 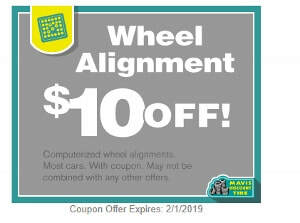 ​Sears Auto Center offers $10-$20 off from alignment service. 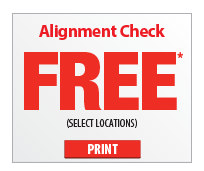 Firestone offers FREE alignment service with the purchase of a tire. See here.